29th October - Autumnal crops are overlapping now with the late Summer ones. 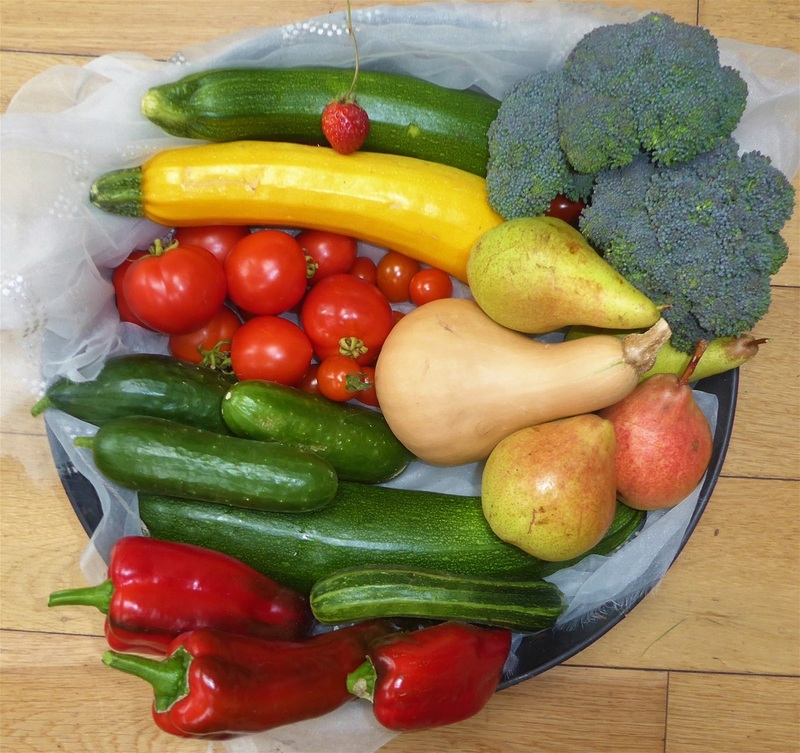 This week we have had a lot to share for Harvest Monday. Starting off then, we have Jalapeno Chillies. We have been eating them throughout the Summer, but now, in case the cold weather spoils them, I have gathered as many as I could to make some pickles. These look very pretty and will add a good spicy crunch to meals. 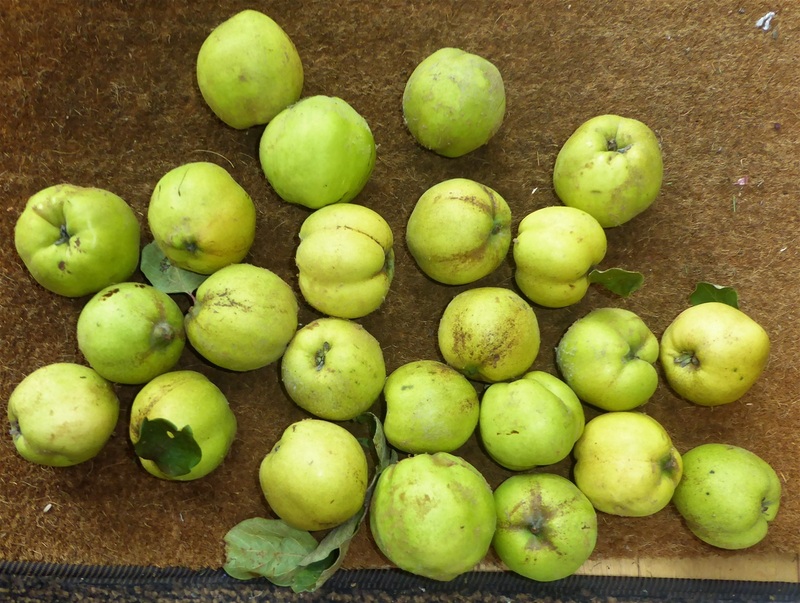 The slightly corky looking marks on the fruits are due to uneven watering I think, but do not spoil the flavour at all, thank goodness. 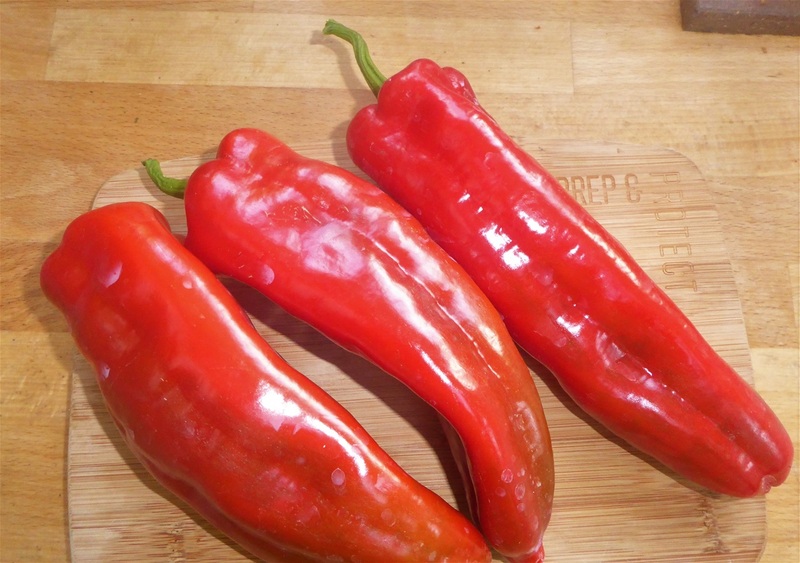 The Padron Peppers are coming to an end now, but they have certainly given us a massive amount of fruit this season. They are a little too thin-walled to enjoy raw really, but are easy to add to cooked dishes for extra flavour, as well of course cooking them on a traditional grill pan. You never know when one will be explosively hot though! Flat Leaf Parsley goes on and on, and this week has been welcome in salsa and to flavour mashed potato. 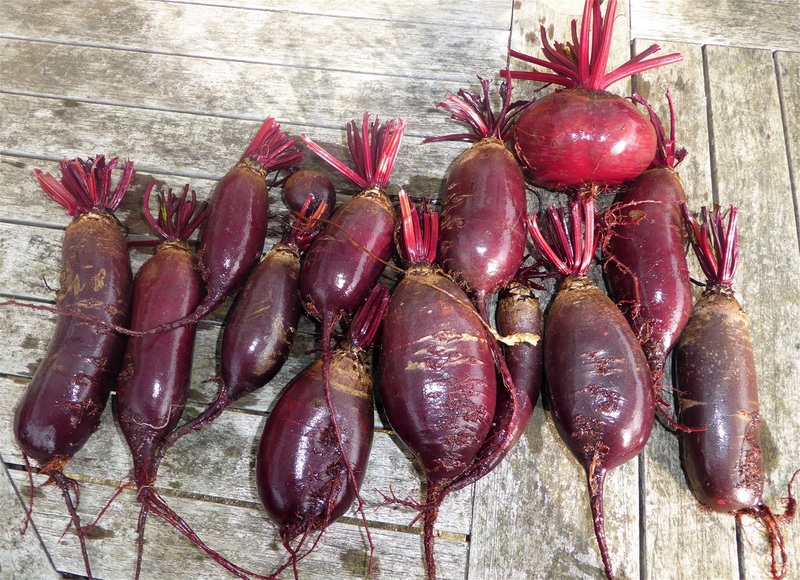 This week we took up the rest of the Cylindra Beetroot, plus some of the Chioggia too. The long ones have been sliced and pickled, some of the Chioggia were given to our daughter, and a couple used to attempt roasted beetroot crisps, very unsuccessfully... I couldn't seem to get the timing right and they were either brown and overcooked, or too flabby. At least I know the new mandoline works well! We have also pulled up some more of the big Chinese Dragon Radishes from the polytunnel, which are very good in stir fry, sliced into batons. 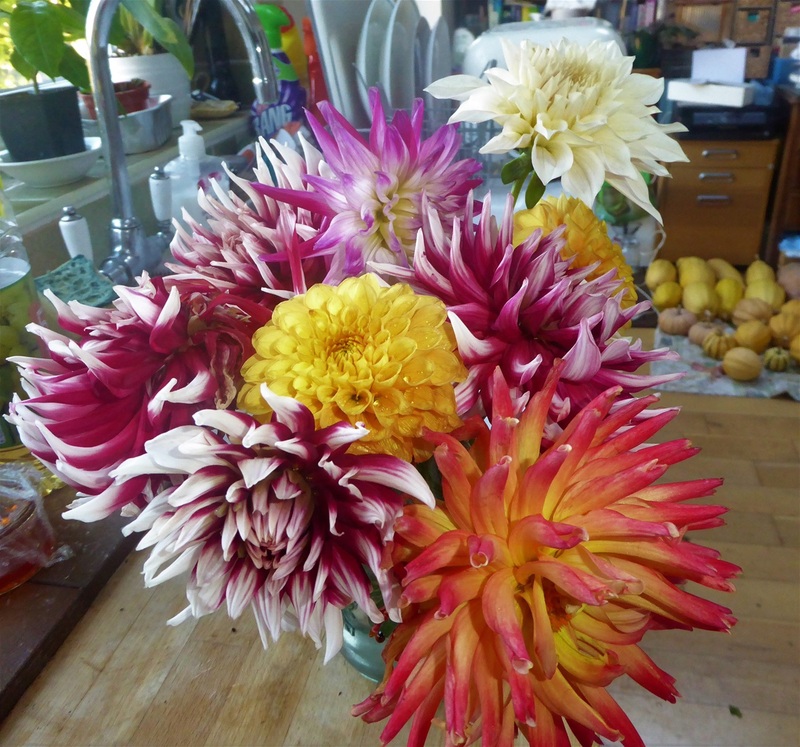 You can see them in the header photograph, along with the non-edible harvest of some of our Chrysanthemums. Whilst we were weeding over the bed where the beetroot had been, we found several sweetpea plants, grown from self sown seed. 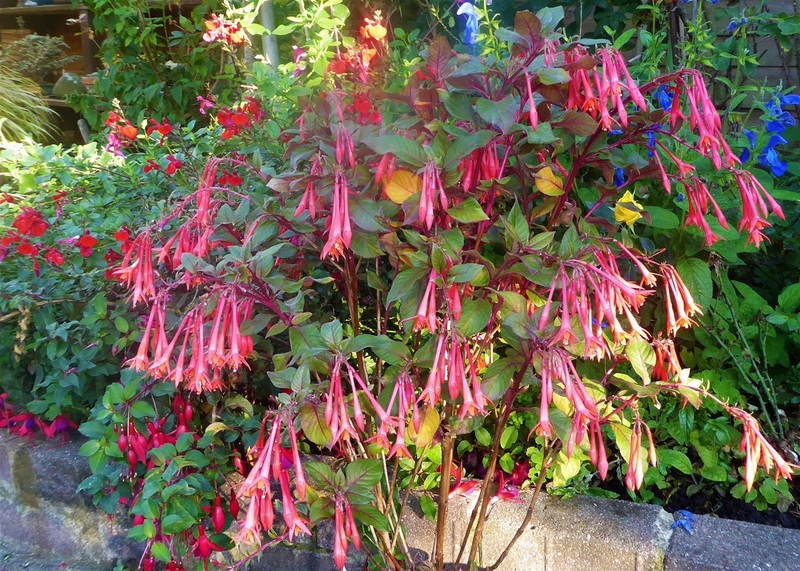 I moved these to the base of a wigwam of canes, and pinched off the top growth to encourage them to branch out. I doubt if they will put on much more growth now, but should be hardy enough to sit out the Winter and grow away next year. 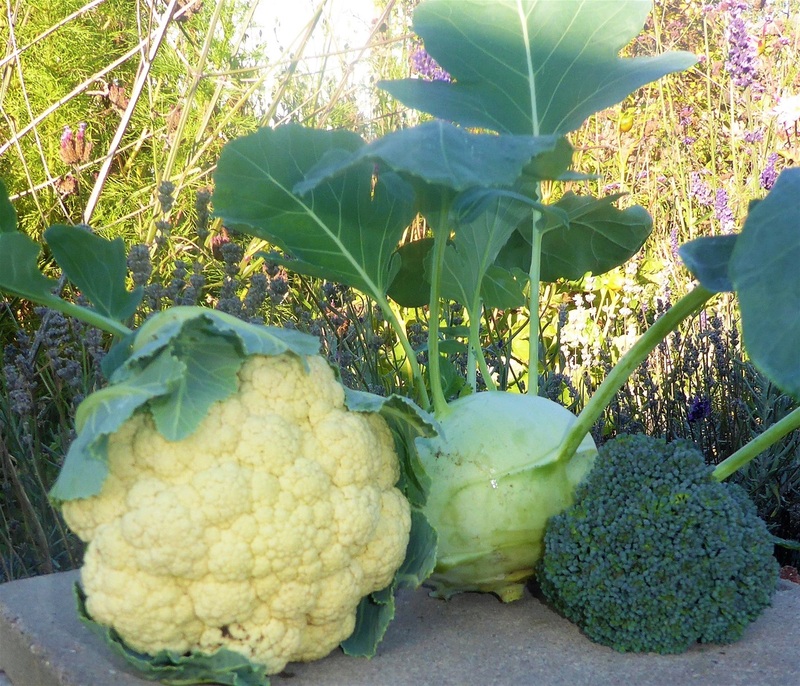 You might remember that the plants we believed to be Purple Sprouting Broccoli turned out to be Calabrese. These are now spent, and have been chopped up for the compost bin, leaving a large empty space in the brassica cage, whilst the small PSB plants I then had to buy in (It being too late to grow any from seed) have been growing under a low protective cloche. Back at home in the garden, the colours are certainly much more Autumnal now. 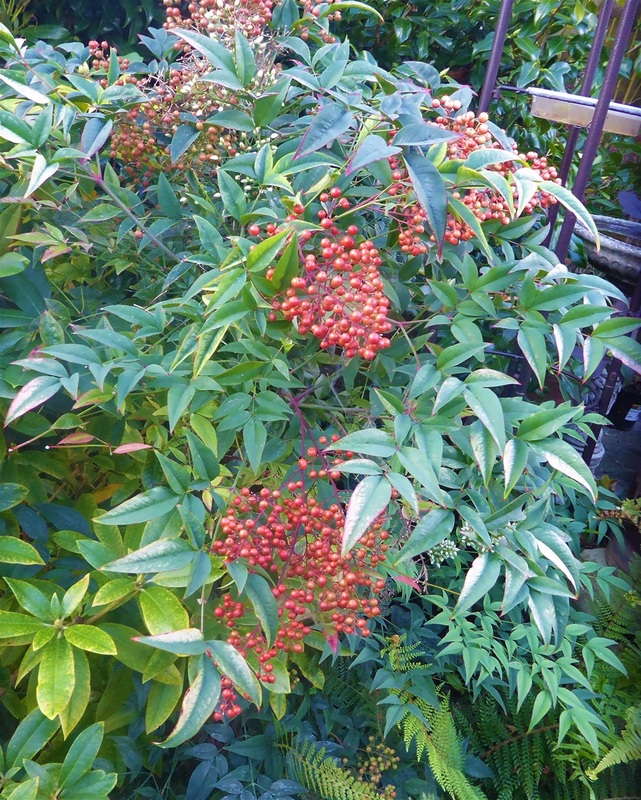 Our Heavenly Bamboo plant has a huge crop of berries, this year, and is still flowering too. 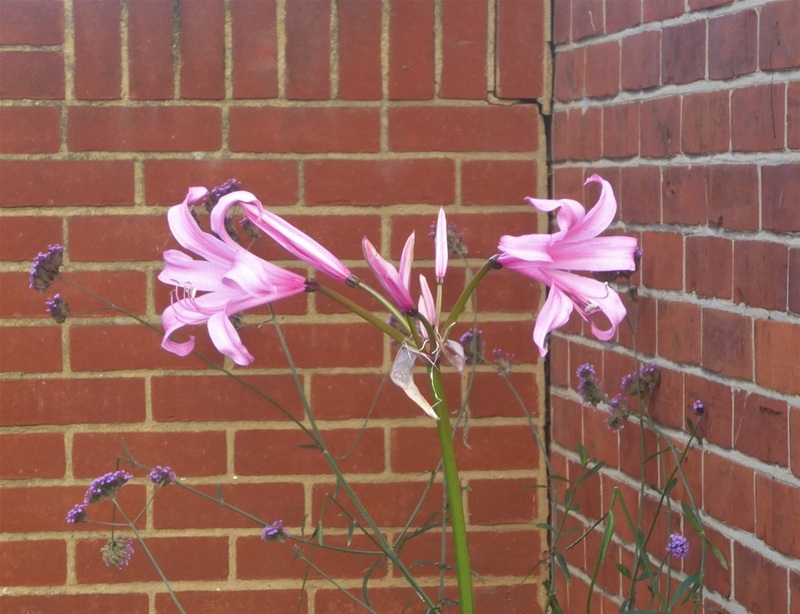 It has had a new lease of life since we planted it directly in the ground rather than being in a large pot. 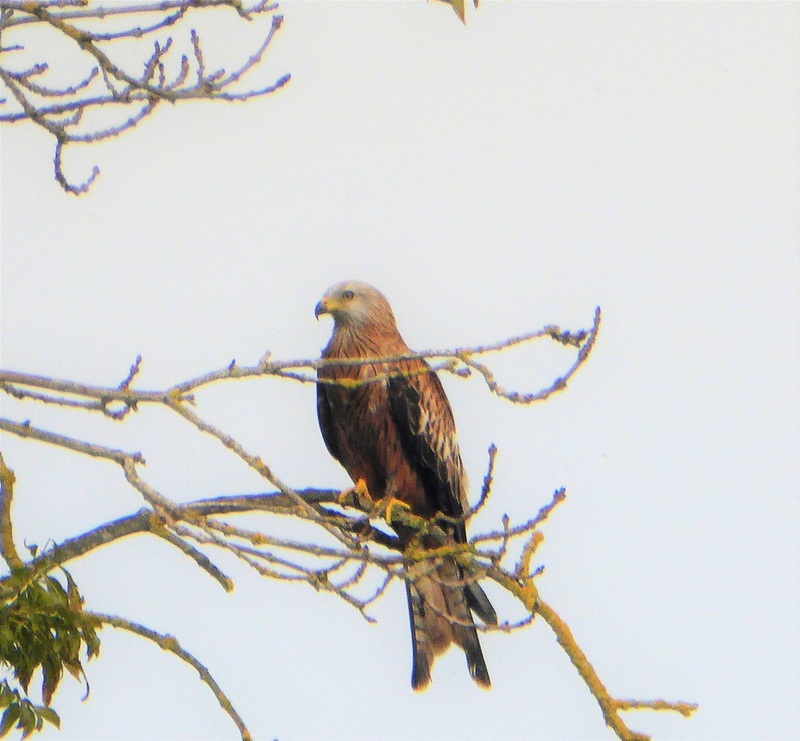 The Red-tailed KItes have been very vocal this week. I think it is the youngsters still calling for food, and their parents encouraging them to forage for themselves. They are always keen to take food from our garage roof, but don't always have the precision to grab it on the wing as the adults do. Tomatoes have been brilliant this year, and with no sign of the dreaded Late Blight, were able to carry on fruiting for months. Before we went on holiday, we took out all except one tomato plant from the polytunnel, as most of them were towards the end of their life, and it seemed unlikely that any of the flowers would grow to full sized fruit and ripen. 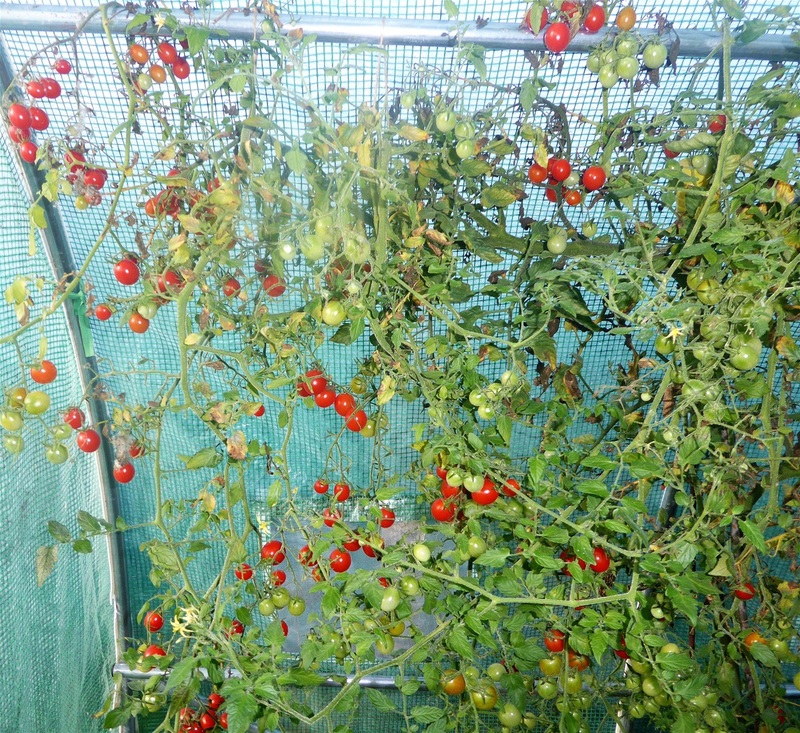 However, the single Apero plant was covered in flowers and immature fruit, and as these are small tomatoes, they were left to see if they would ripen. The continuing warm weather has resulted in another large trayful of fruits. 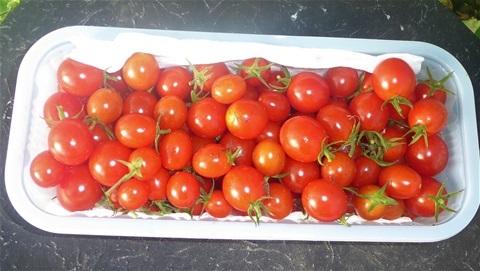 Apero is a very flavoursome tomato, easy to snack on and very good in a mixed salad... one to grow again for sure! 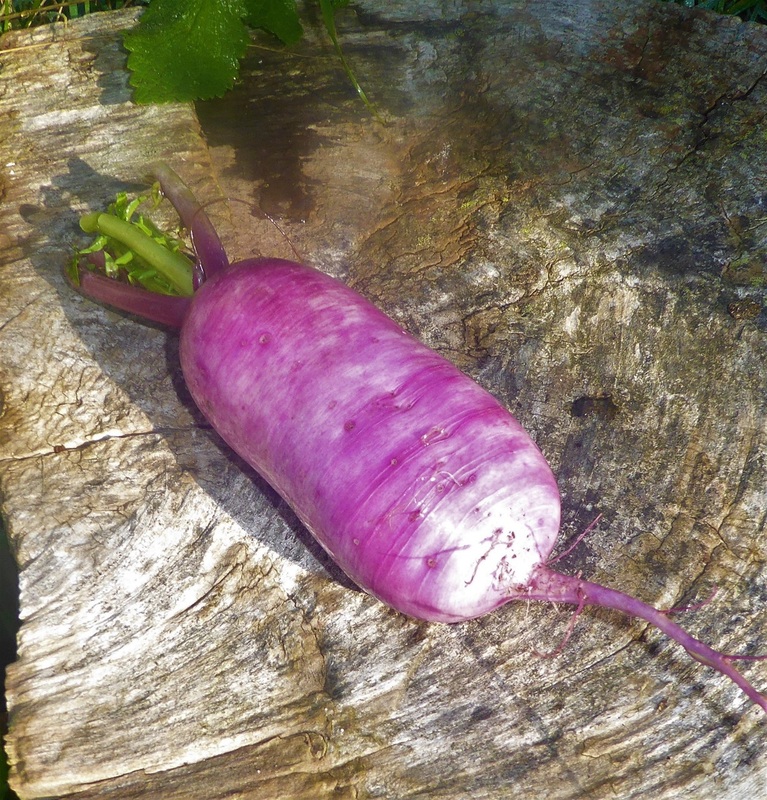 A "first" for this year is a Chinese Dragon Radish. This is much paler pink than the ones we grew last year, but it is certainly fresh and spicy. 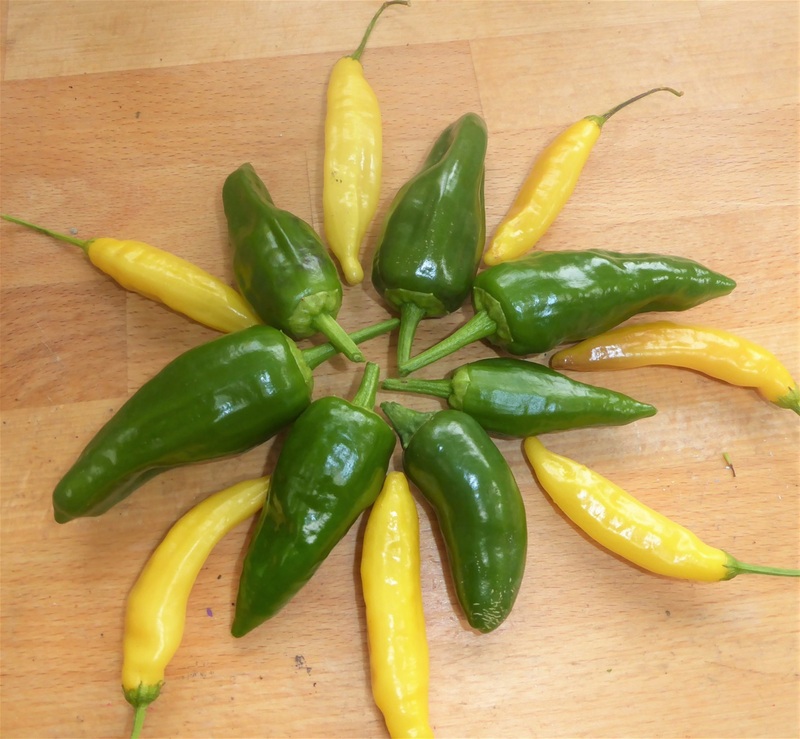 The lighter colour may be due to them being grown in the polytunnel, and when the ones sown outside are large enough to eat, these may be brighter.. we shall see. Either way, these are really good sliced thinly lengthwise, in a sandwich with cheese, as well as cut into batons and added to stir fries. The flat-leaved variety self sows everywhere. The seeds even survive the compost process, to come up in random places. 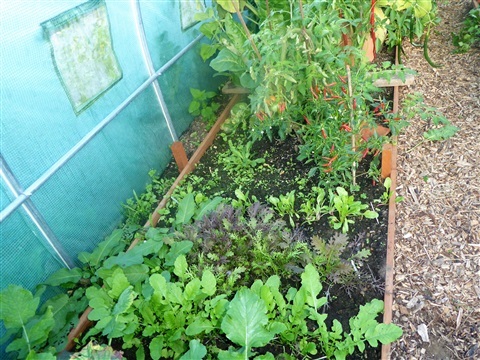 I have transplanted some small plants into the polytunnel to give them some protection from heavy rain or snow, and provide us with cuttings in the Spring. 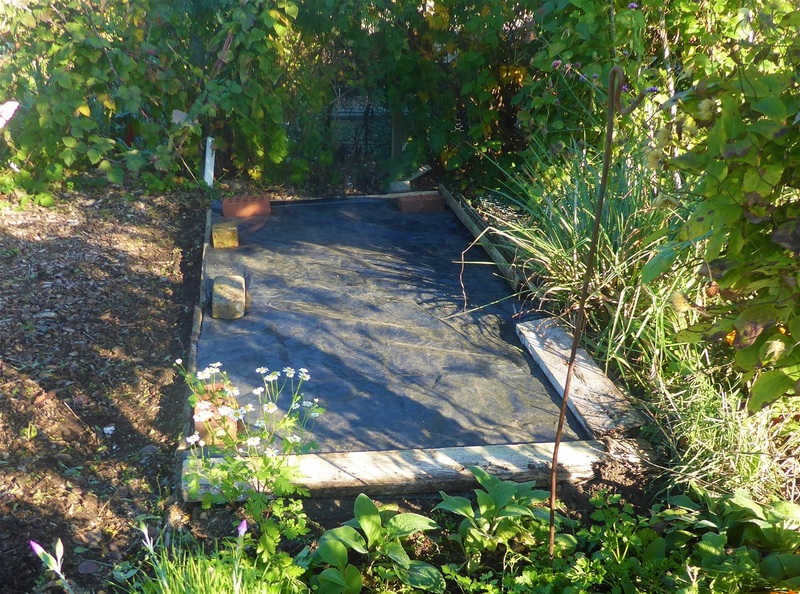 Outside, there is a small bed of plants that will take their chances, and although much of the foliage will die back, I hope they then produce fresh growth around late March. 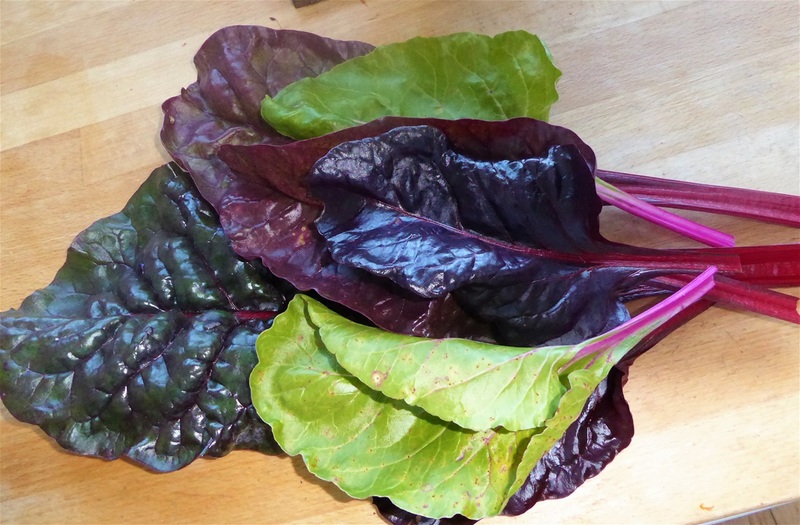 Our final harvest for this week is Chard. 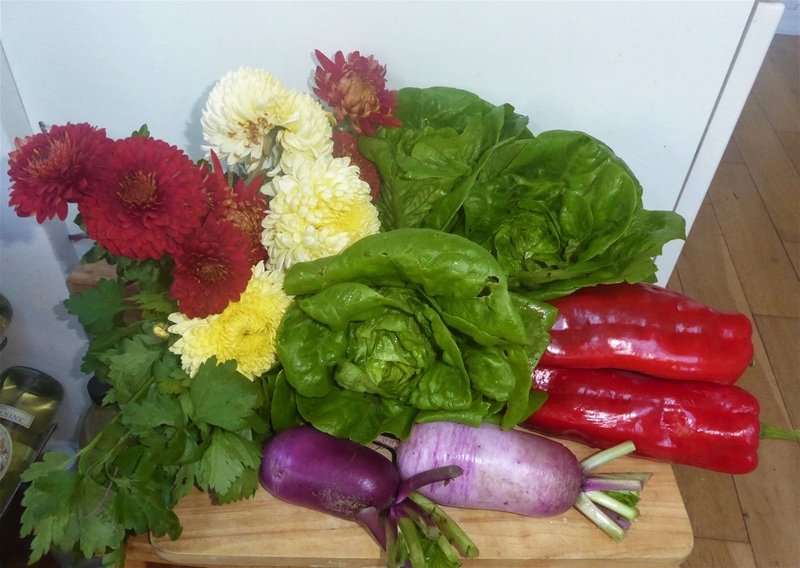 It has been a bit neglected in the past month or so, as we have had lots of brassica harvests as well as Malabar Spinach, but with the low sun shining through its leaves giving them a beautiful radiance, they looked irresistable this afternoon, so some are going in tonight's stir fry. 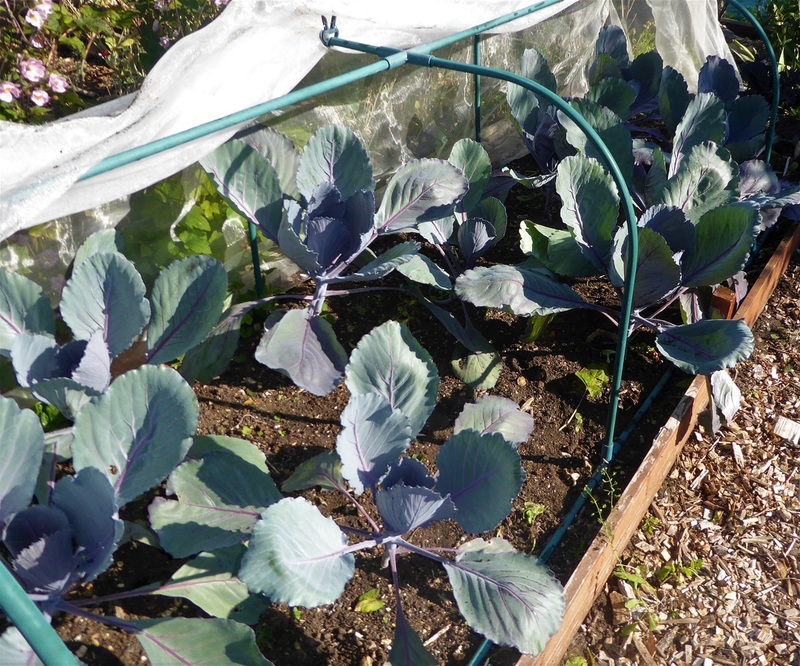 Down on the plots, the crops that will continue to grow during the Winter and Spring are now in the ground: Kale, Purple Sprouting Broccoli, Brussels Sprouts, Cabbages, Leeks, Garlic and Autumn planted Onion sets. These last two won't be ready until the beginning of Summer next year, bu the others will all give us lots of fresh food in the coming months. 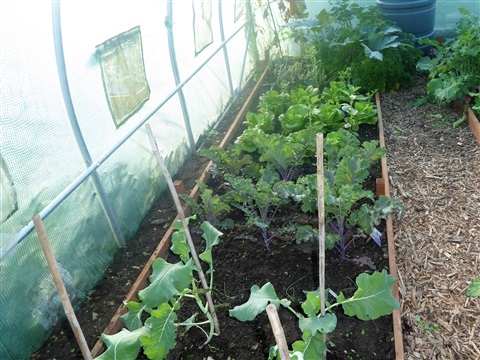 In the polytunnels, the recently planted crops are clearly much further ahead than those outside, which hopefully will mean earlier crops of kale and Purple Sprouting Broccoli. 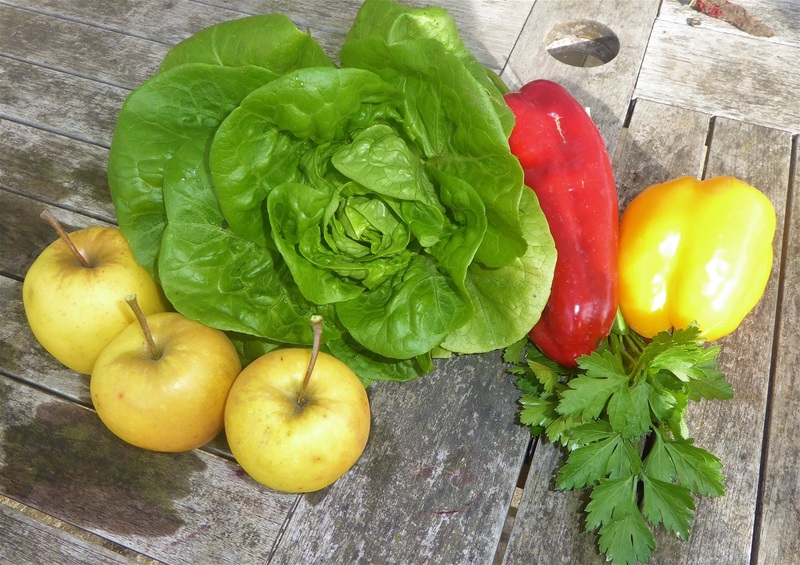 There are lots of Winter Gem lettuce ready to pick, and the Mustard Greens and Perpetual Spinach are ready to transplant into their final places. 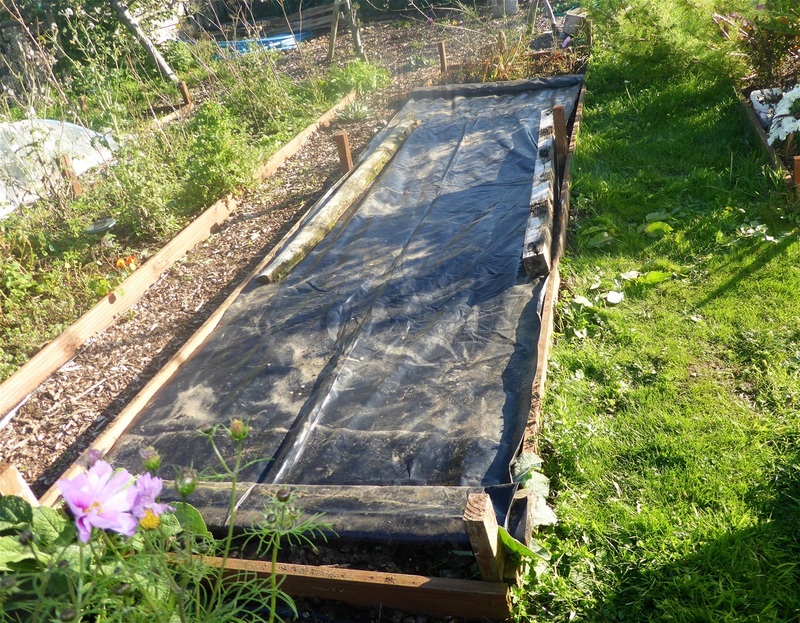 The Hi-Keeper onions sown a few weeks back are now growing more leaves, and the six broad bean plants have successfully moved from the path where they germinated to the veg bed under cover. 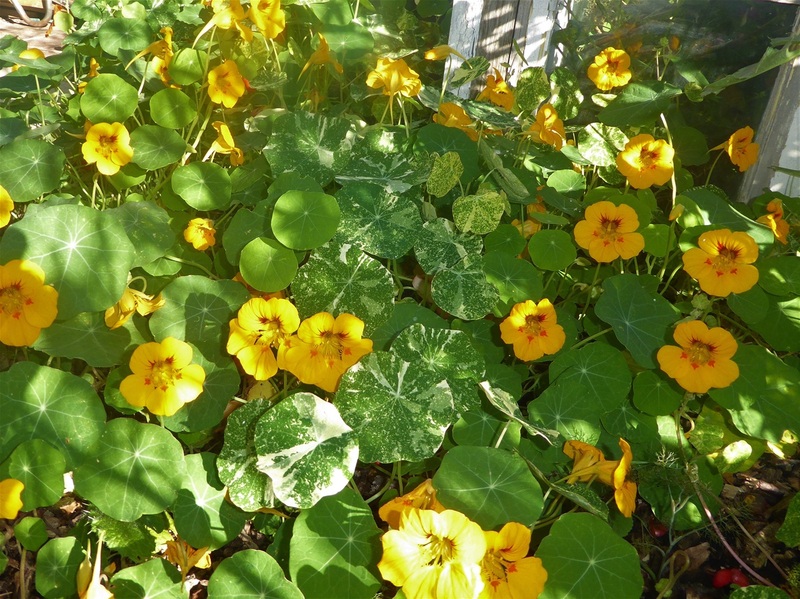 But now, after some decent rainfall, they have sprung into life to give a onderful display of orange and yellow flowers and lush foliage, unspoilt by the ravages of caterpillars or blackfly. 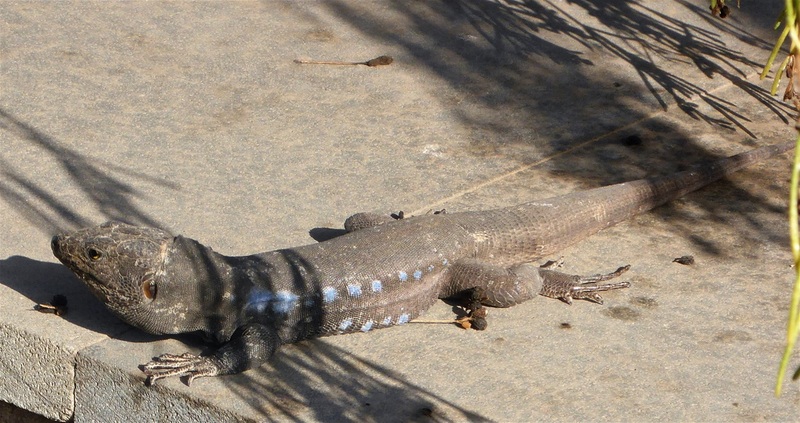 Nature has a way of coming good, and this just proves it! 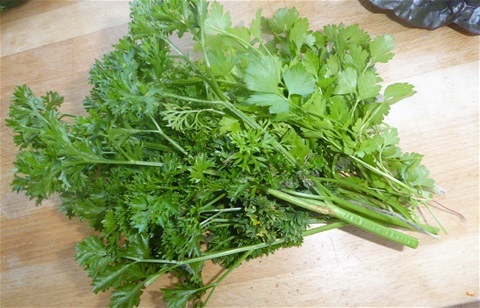 Plenty of leaves for pesto, flowers to adorn late salads and juicy seed pods to pickle! 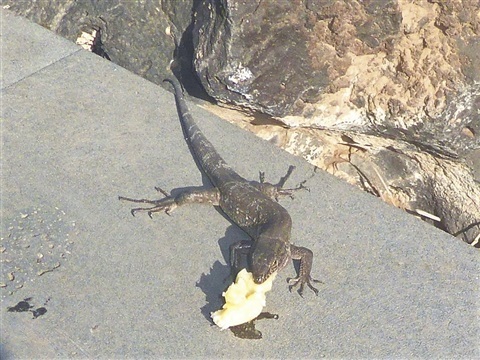 I had no idea lizards could make so much noise, hissing and growling at each other, squabbling over the pieces of banana. 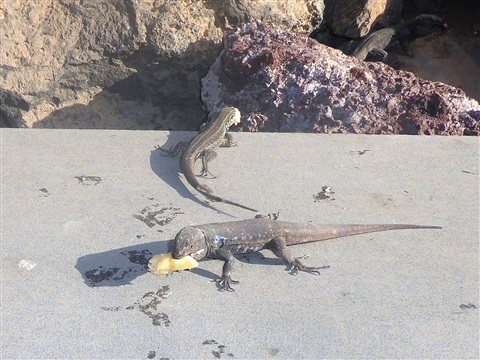 It was alright feeding the smaller ones, but some of those large males looked like they meant business, and could probably give you quite a bite in their enthusiasm to grab the food. 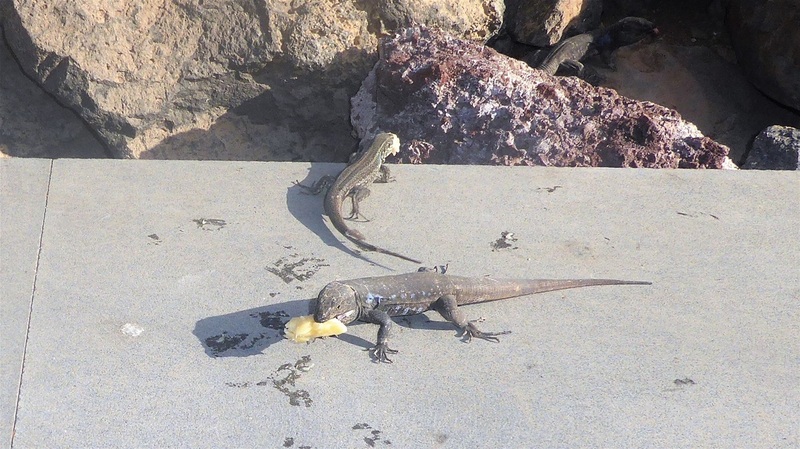 I was quite glad Abi put the banana on rock for the male that was eyeing it up, before he leapt onto his hand! I'll be back next week, hopefully with news of our special shallots and with a few more of the beds down on the plots ready for their Winter rest. 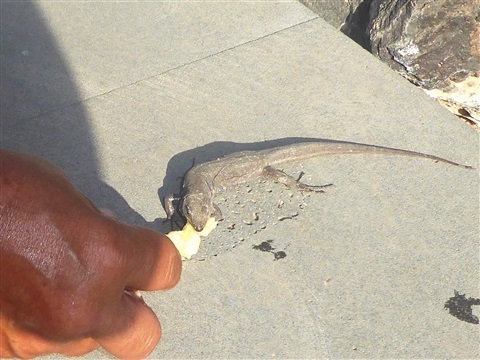 After reading up about these lizards, it turns out that in some areas they have become very tame because people feed them. They eat insects, but also fruit, and they are especially fond of ripe banana. 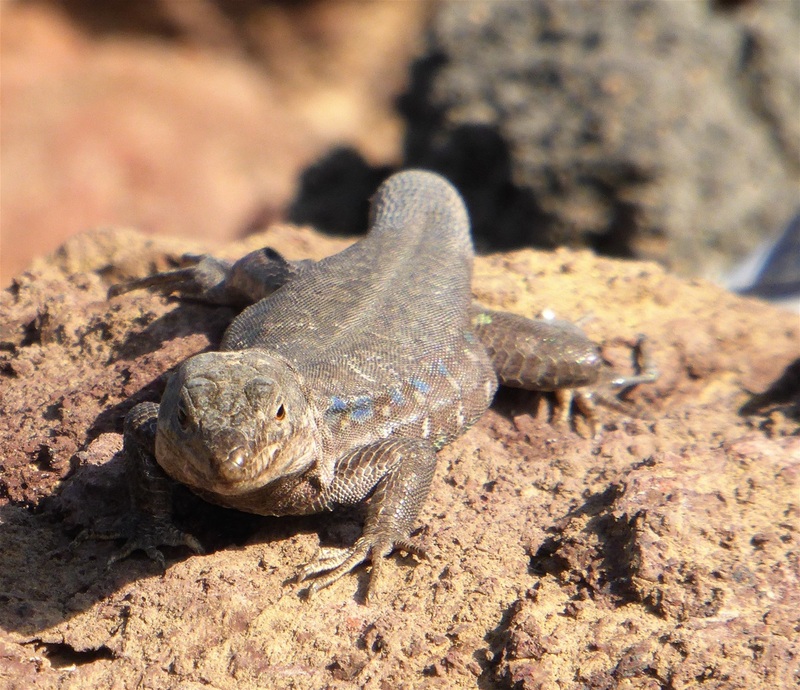 I can only assume that as this area of the barranca was close to a public park, that a small colony of lizards has become accustomed to seeing people as a source of food. 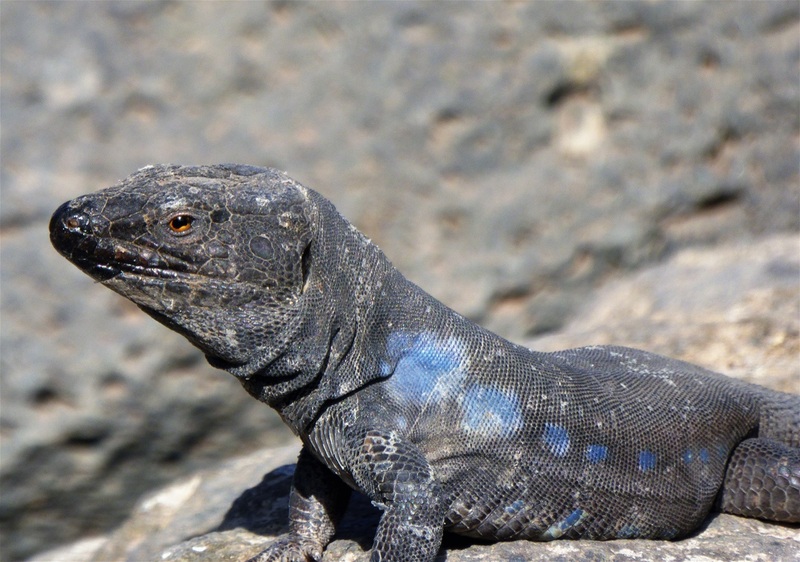 When Abi stretched out his hand towards one of the males, it then ran forward very quickly, head outstretched, as though expecting food. 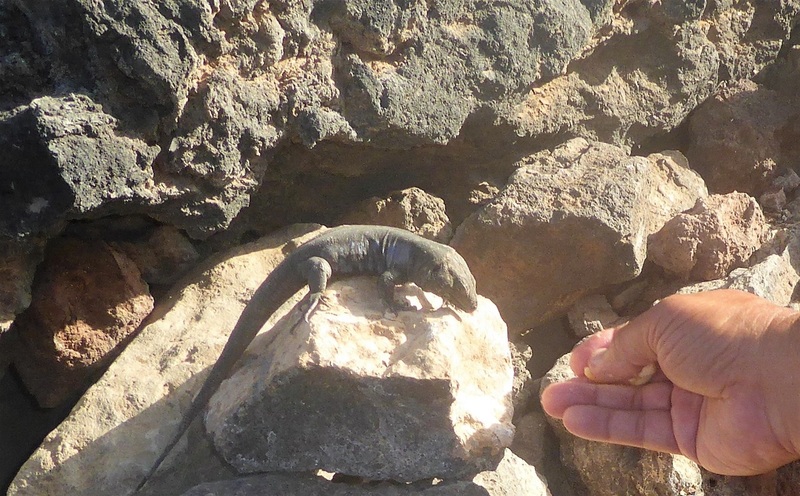 I wish I'd waiting a few seconds before taking this photo, as it came even closer than this. 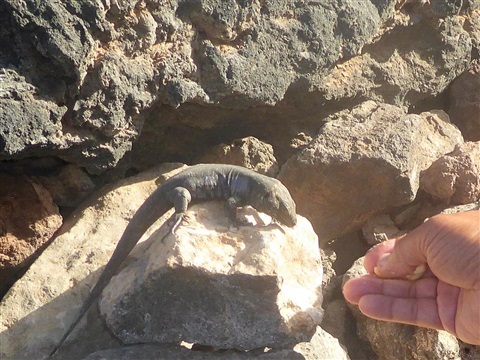 No prizes as to guessing what we shall be doing later in the week, as the chance to feed wild lizards like this doesn't come along very often. 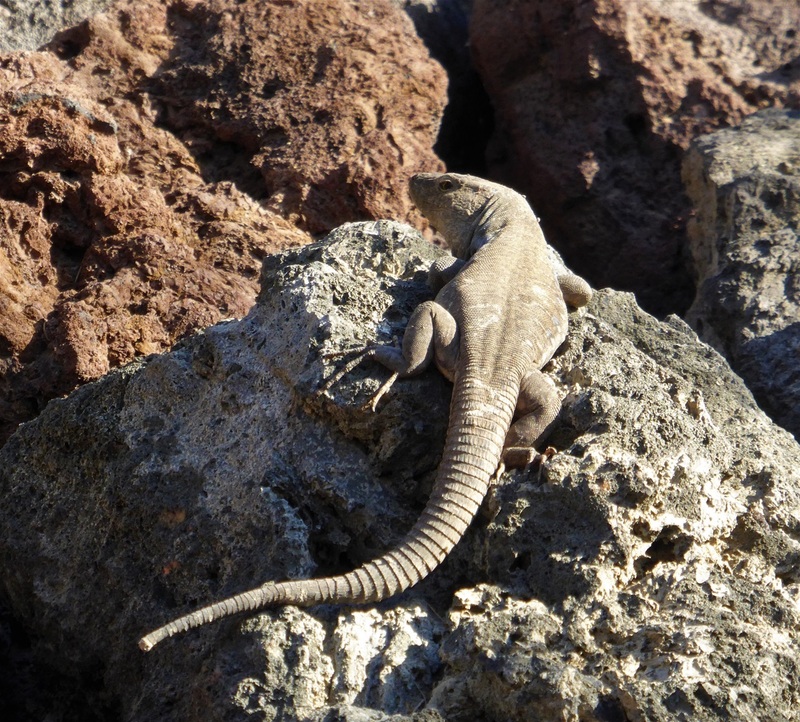 It is quite amazing watching them swarm over the rocks towards you like this, so we are really looking forward to another encounter. 1st October - Such a lovely surprise!!! 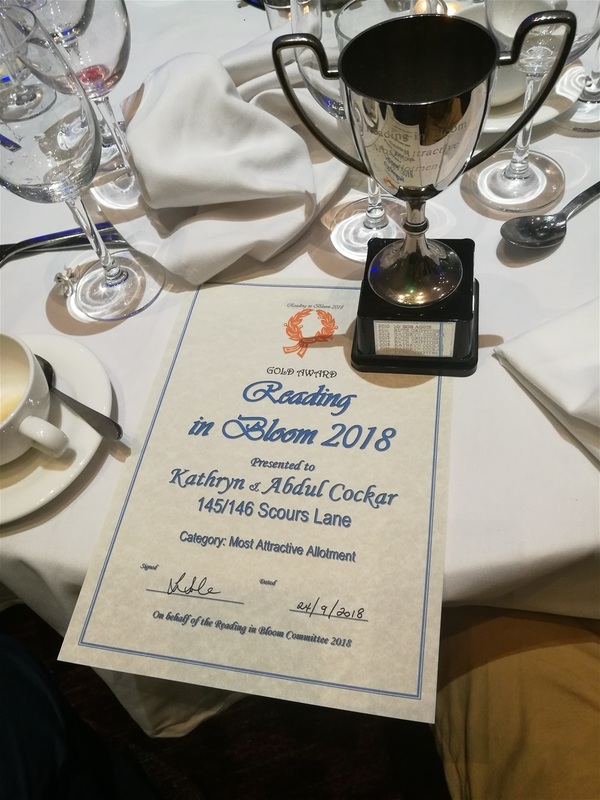 We were invited to the presentation evening to celebrate the awards for the RHS Reading in Bloom again this year, and once again I was unable to go as I was away with my brother, so our son accompanied Abi to the posh meal at a local hotel in my place. When the Allotments section came around, our joint entry was awarded the Gold in the Most Attractive Allotment category. We had laboured long and hard during the drought months to keep as much as possible alive and productive, and with over 520 sq m to work with, it took real graft every single day, and we were so glad to have our one borehole water and not be taking water from domestic sources. 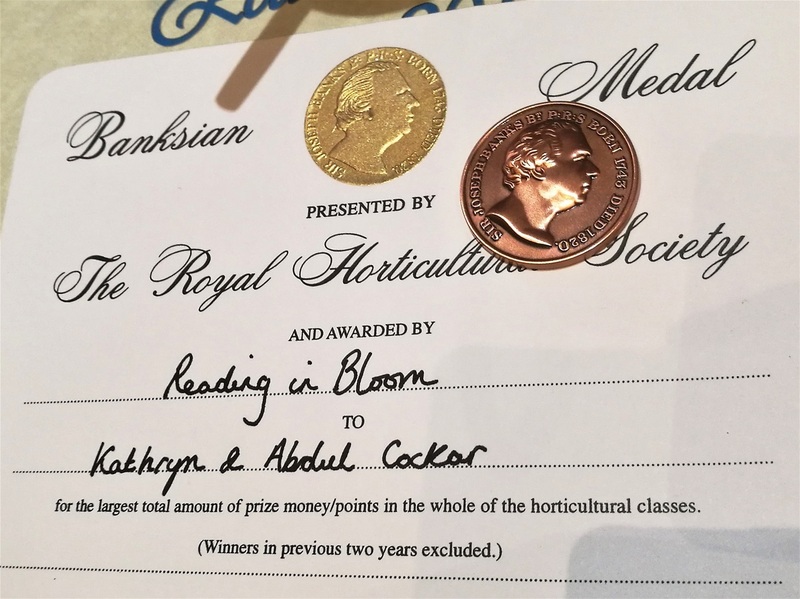 Our son sent me a photo of the certificate and the cup, but then a second photo arrived, entitled "Oh, and this...." and it was the Banksian Medal, awarded for the most points awarded in any of the Reading in Bloom classes, not only in the Allotment categories. WOW! I never ever, ever, ever thought we would earn anything like that. What an accolade! Pears: Just a few still hanging on the trees, ripe enough to eat. How did we miss these before? They do taste luscious though. Butternut Squash; Now that the night times are cold, verging on frosty, it is time to bring the whole squash crop home. 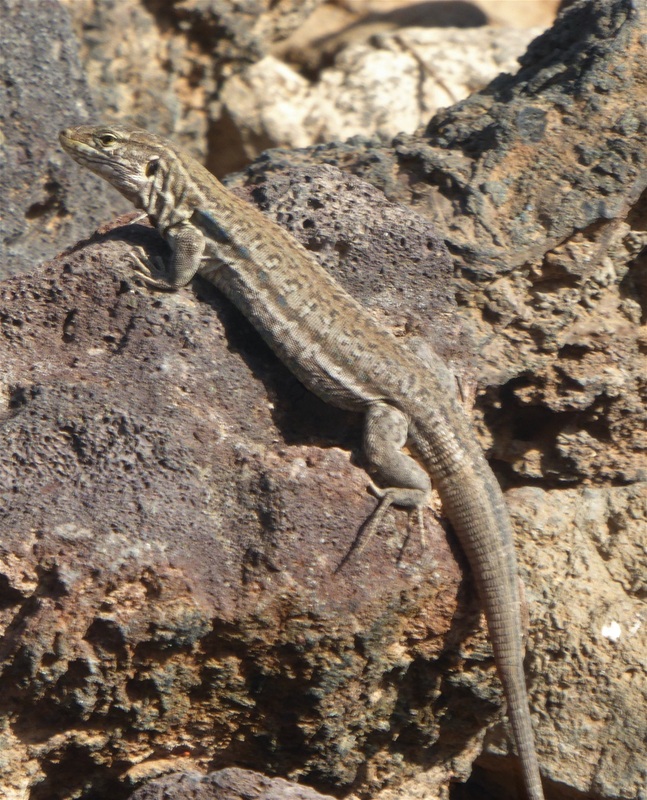 There were some smaller ones still lurking amongst the fading leaves, including this perfect-looking one. 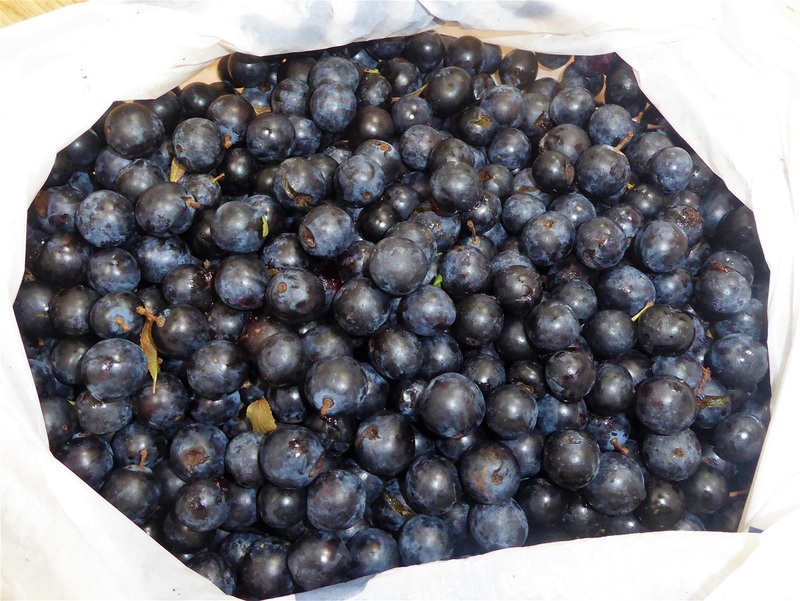 I picked 2.5kg of Sloes last week, from the bushes alongside our chalet, to use for Sloe GIn. Usually at the time in the year they are very firm, but unusually this year they are very ripe, ripe enough in fact to be falling from the bushes. Most of the leaves have turned yellow and are falling too... a sign of stress after such a dry Summer I think. I have put the bagful of sloes in the freezer, as then the skins will rupture, enabling the flavour of the flesh to be better absorbed by the gin when they are soaking. Picking sloes always reminds me that it time to strain last year's batch, so once we return from holiday I shall be on it. 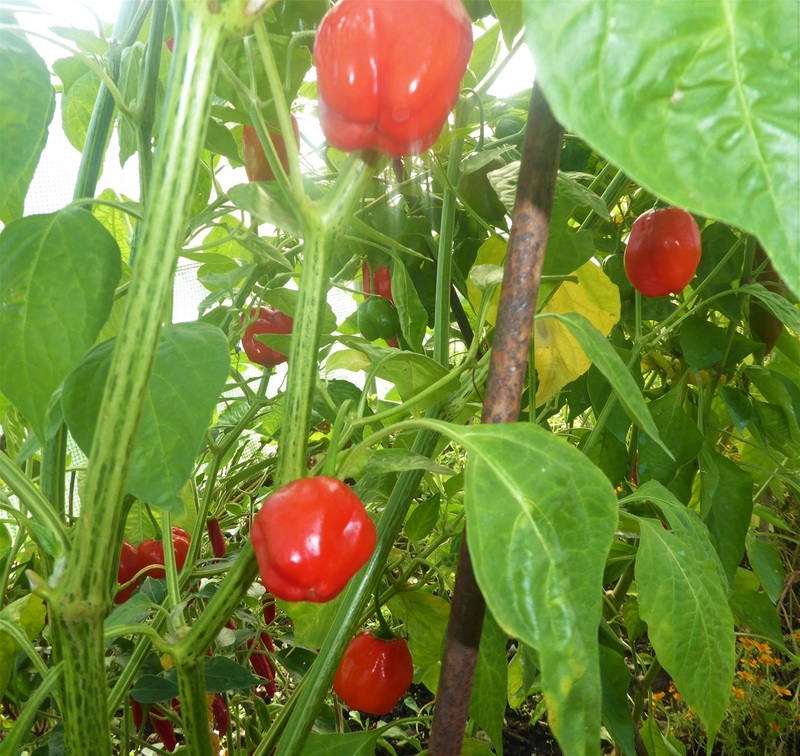 I am looking forward to the first taste of the new "brew"
Some of the crops are still ongoing, especially the Sweet Peppers: Long Red Marconi have cropped heavily and are thick walled and juicy. Another one to grow again next year. The ones I picked yesterday have been salted, and joined the cucumbers in a mixed pickle, similar to the style they use in Bulgaria, a recipe given to me by Sarah, a departed friend. There is where our harvest this week ends. In the couple of days between coming home and going off on holiday with Abi, we have both put in long hours at the plot: Garlic is now planted .... saved cloves from our last crop, as it was so successful. Planting them deeply seemed to help, so these are down with about 5cm above the top of the clove. Thye are in the bed cleared of courgette plants, with 5cm of home made compost tickled into the surface, along with some Blood, Fish & Bone, so they are well set up. The Autumn Onion sets are also planted: Shakespeare, a round, brown-skinned variety which we have grown before, and Red Dawn. Red onions seem more prone to bolt in the Spring, so I am hoping that is variety bucks that trend. The soil had Blood, Fish & Bone added, to support root growth so they can get going before the soil gets cold. 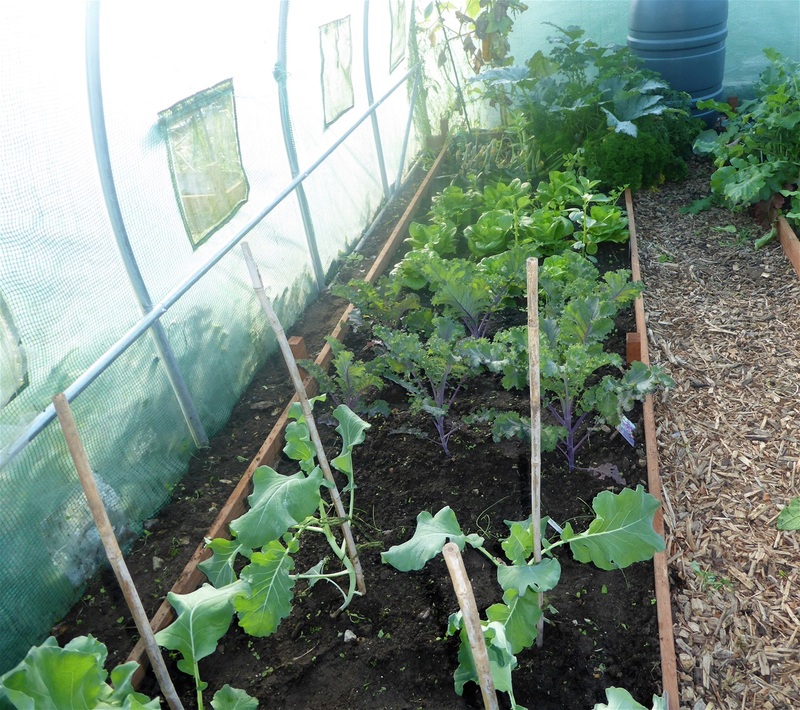 The cold nights bring a touch of frost now, and so I have moved the Yacon plants inside the polytunnel, to keep them going a little longer. The pots are quite heavy, so I hope they are full of big, fat tubers when we come to tip them out in another few weeks. These new ones were planted in our alpine sinks in gritty compost, and not fed at all.Then, lo and behold, one has flowered!! Such a beautiful colour, with petals that almost look crystalline. I know there is just the one, but maybe next year the others may feel inspired too. That is where I shall end for this week. I shall be back with an update as soon as we get back home. 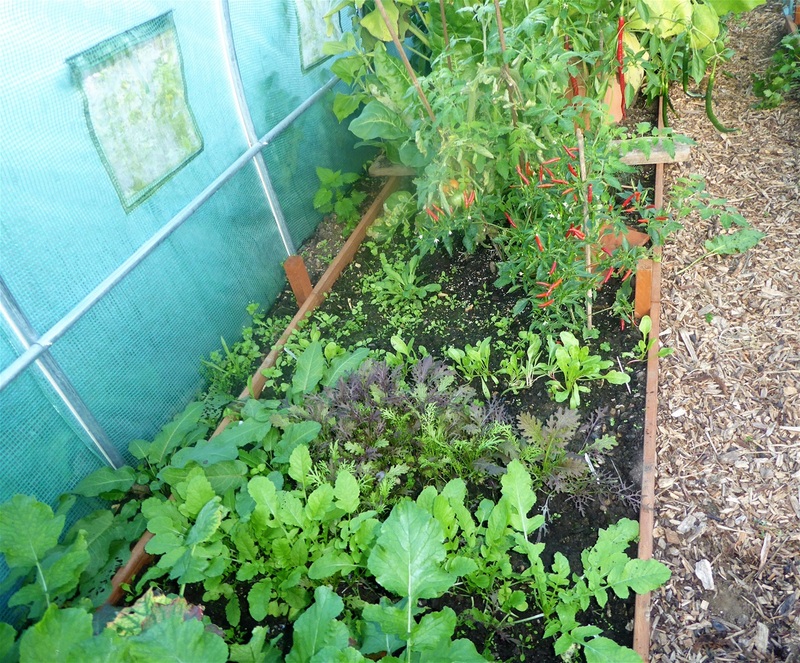 Our neigbour who has a plot on the same site as us is going to water the plants in the polytunnel and greenhouse while we are away, and anything else that migth need it is the weather is very dry. 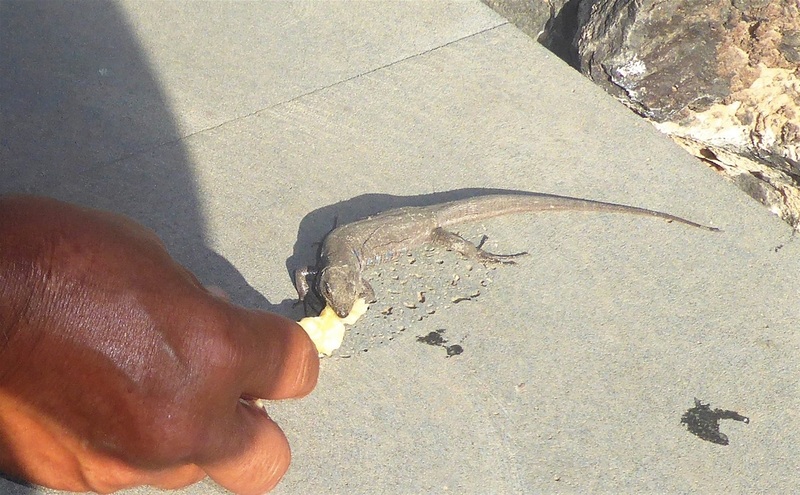 Thank you, Clive .... please help yourself to courgettes. No really, please!!! !